As I continued working with my counselor, I was able to identify three other feelings that were eating me inside: fear, guilt and shame. I felt so bad about them that it took me a very long time to admit that I was harboring them. To have the most precious thing in your life been affected by a disease that doctors know so little about and has no standard treatment or protocol, absolutely terrifies me. Knowing that JXG could develop internally or in Santi’s eye is like having a ghost constantly haunting the back of your mind, no matter how low chances are. 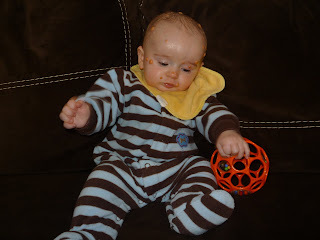 I used to look for new lesions every time I changed his diaper (which translates to almost 8 times a day!) and I would stared at his iris in the light, looking for the orange spots. I also did not want us to go out because of fear to have another New Year’s experience. I decided that we should only visit family and close friends who already knew about his condition. It was even harder to acknowledge how guilty I felt about having these feelings. I knew of other children with histiocytic diseases that needed to undergo surgery or chemotherapy. I should be grateful that Santiago’s condition was benign and temporary and that was what I told people. However, deep down in my heart, I knew it was not true. I kept comparing us with all the healthy kids instead. But the hardest one to recognize was my feeling of shame. It was so quietly embedded in my soul that it was not until my counselor said to me: “it sounds like you feel embarrassed by Santiago’s spots”, that I would allow myself to admit them. What type of mother for Peter’s sake feel ashamed of her baby’s appearance?! I was the shallowest person in the world, a monster, and I cried an ocean for confessing my sin.“I completely hate Santiago’s spots and feel ashamed by them and the way that people look at us because of them”. There, I finally said it! After I put myself back together, my therapist told me that to feel bad about feelings is as crazy as saying “I feel bad because I sweat when I run”. Feelings form in our hearts in response to our circumstances and we cannot control that. However, we can decide “what to do” with them but for that, we must acknowledge them first. As the next step towards accepting JXG, my counselor suggested to join a support group for parents whose children have been diagnosed with JXG and I thought that it was a fantastic idea!. I wanted to teach Santiago to live his life pursuing happiness not avoiding fear. This meant for me figuring out how to coexist with JXG instead of being governed by it and who better than other parents to show me how. I went home and for the first time I sat at the computer looking for support instead of information on JXG. I went to Google and I typed “Juvenile Xanthogranuloma Support”. Valentine's is without a doubt coming €"happy holidays- and no end of individuals that do not order any specific product though can be type forfeited and realize what to own. Ordering omega replica sale is a decent cure for eliminate one as a result of the anguish of purchasing a better product designed for every one you're sure and even shopping malls have probably always been hard to navigate. replica chanel handbags can be appropriate product for a lot of many people regardless is usually the union you have got; it is easy to product running watches to help you co-worker, relatives, young couples, including young ones. Switzerland Htc legend running watches have been completely truth be told there a long time, they are really always popular and even contemporary, issuing fake chanel bags to provide a product to help you everybody means nothing but thankfulness and even real love with them. To be chanel replica sale grants them all a benefit over-all several other running watches; some people really mean very good high-quality and even pattern. Switzerland Htc legend running watches designed for fellas might most likely make one differentiate yourself involving the acquaintances and even extraordinary ones own co-worker at the workplace, fellas are typically around running watches. Oahu is the primarily replica rolex they may be dressed in whilst still being end up competent, it will be suitable for professional occurrences plus party through mates.